Sri Krishna Pharmaceuticals Limited, known informally as Sri Krishna Pharma, is an established manufacturer of pharmaceutical products such as acetaminophen (paracetamol), folic acid, domperidone and furosemide, supplying more than 150 niche drugs to the Asian pharmaceutical market, as well as Europe and the USA. When expanding production at one of their facilities to include the manufacturing of paracetamol, the company sought a pharmaceutical vibrating screen. Having previously supplied the company with high performance screening machines, Sri Krishna Pharma approached Russell Finex for a solution. 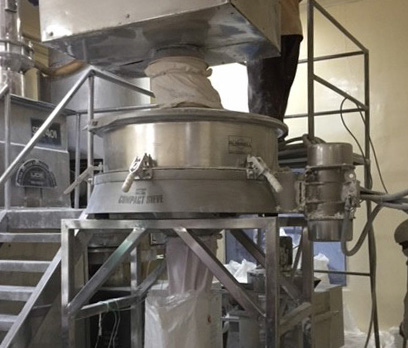 With more than 80 years’ experience supplying pharmaceutical solutions to global customers including Pfizer, GSK, Wyeth and Sanofi-Aventis, Russell Finex analyzed Sri Krishna Pharma’s unique requirements and supplied three 900mm diameter Russell Compact Sieves with Vibrasonic® Deblinding Systems. The Russell Compact Sieve® is a high capacity check-screener, capable of achieving higher throughput rates compared to conventional machines. The enclosed system is ideal for the pharmaceutical industry as it provides total containment, protecting operators from any harmful dusts or fumes. High-quality stainless-steel contact parts enable easy cleaning, and the unit can be easily dismantled and assembled without the need for tools. Due to the nature of API’s, mesh blinding can often be experienced when screening these pharmaceutical powders. Fitting the Russell Compact Sieve® with the Vibrasonic® Deblinding System ensures these powders can be screened on finer meshes without compromising flow rates. Contact us to learn how the Russell Compact Sieve® and Vibrasonic® Deblinding System can help to improve your product quality.